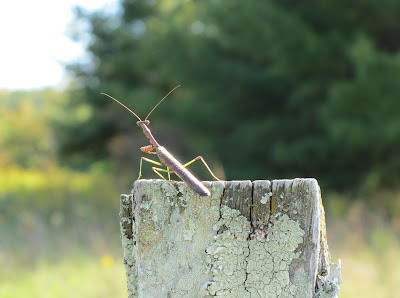 I was collecting Prairie Dock seed from the garden plants when a Praying Mantis flew from the tall stalks and lit on a nearby fence post. 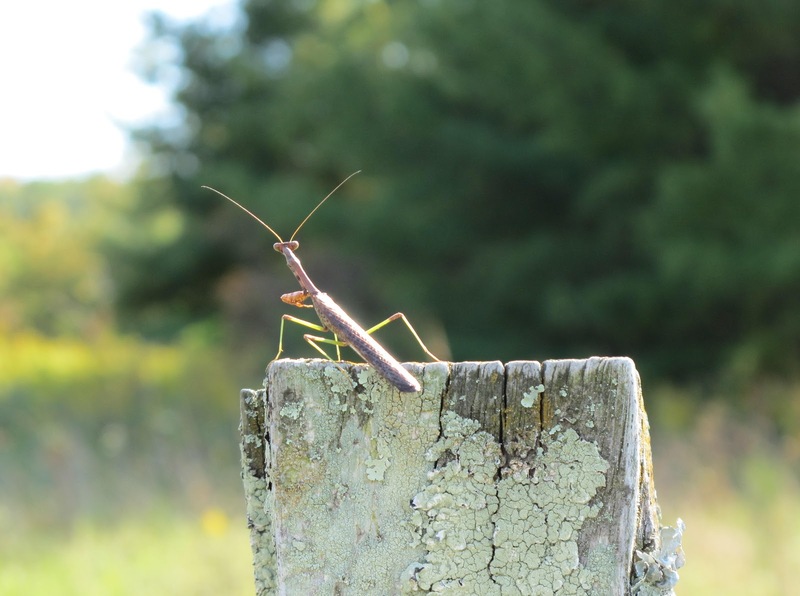 An airborne mantis is a common sight in the fall, so I wasn’t surprised by its appearance. What excited me was its small size. 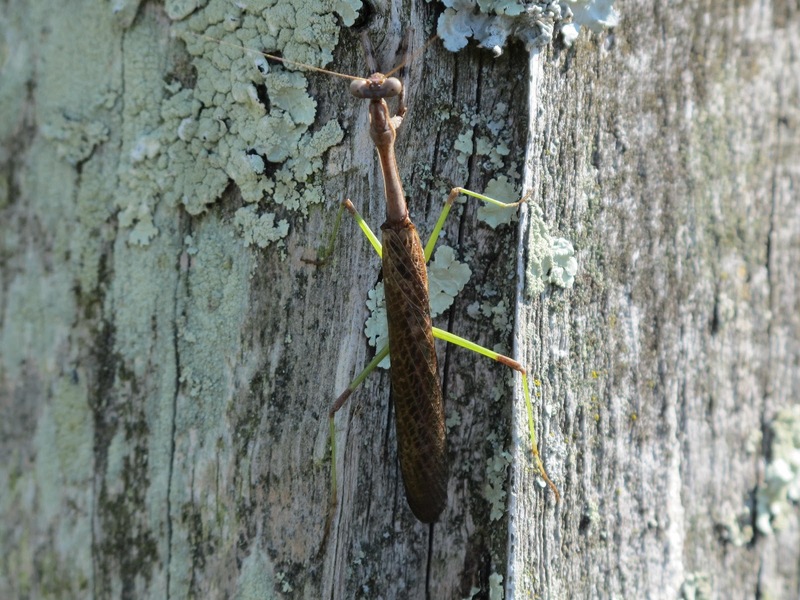 After years of searching, I was seeing my first Carolina Mantis, Stagmomantis carolina, at Blue Jay Barrens. 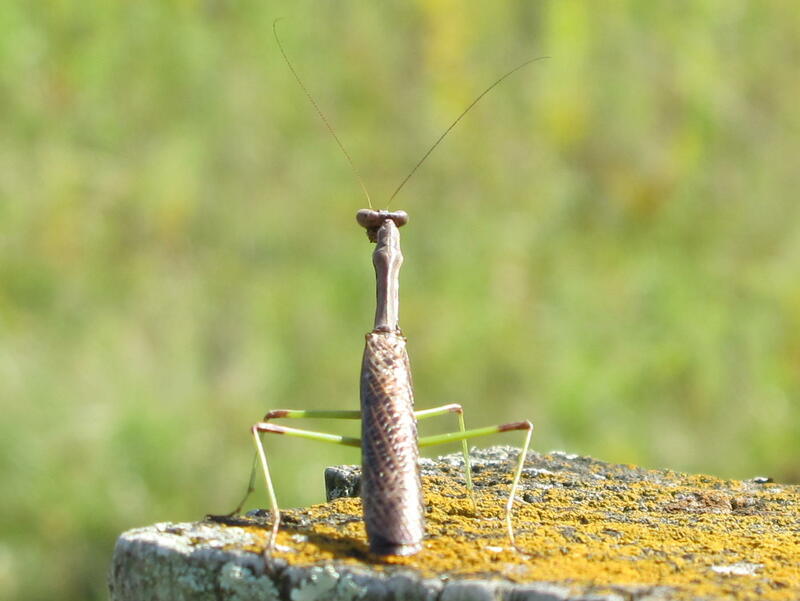 I hoped that this species was in the area, but all I’ve seen during the past 27 years has been the introduced Chinese Mantis, brought here from Asia to control insect pests. Of course, at the time they released the first mantis into the United States, people felt that all insects in the garden were pests. Now, over a hundred years later, some of us are more discriminating and don’t appreciate an exotic species that eats any insect it can catch. 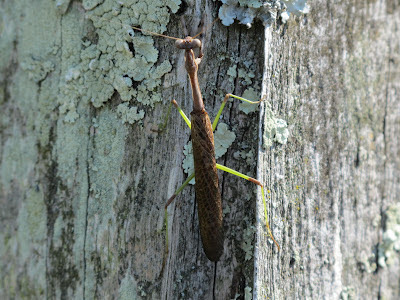 Carolina Mantis is the only native mantis in this area. They can vary in color from green to brown, with the brown form having a mottled pattern especially noticeable on its large front legs. Their size is just a little more than half that of the Chinese Mantis, but I think that makes them twice as cute. This individual is a male. Females have wings that are only about half the length of the abdomen and are not capable of flight. The female’s abdomen is also much wider than that of the male. 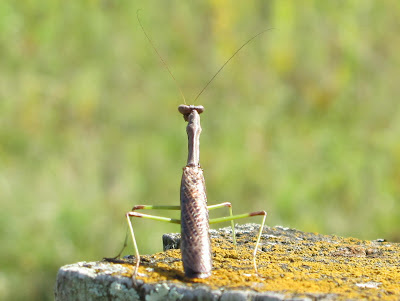 I have read that non-native mantids are thought to have displaced the native species. 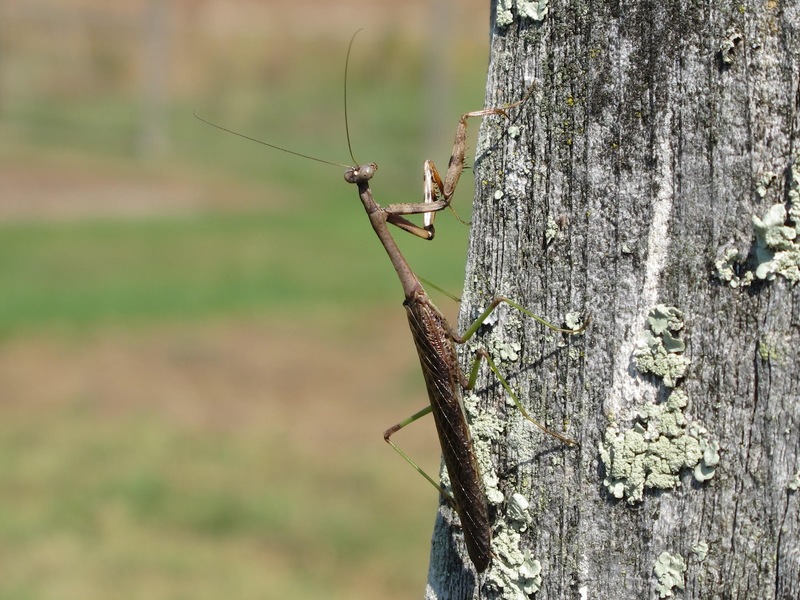 Noticing an abundance of Chinese Mantis at Blue Jay Barrens, I began 10 years ago to reduce the population size of this introduced species. I started conducting an annual search for egg cases and destroyed all I found. Fortunately, the large egg cases produced by Asian mantids are nothing like that of the Carolina Mantis. After a few years I noticed that it was becoming more difficult to find Chinese Mantis egg cases and fewer adults were seen in the fall. I like to think that my efforts are the reason I’ve now seen a Carolina Mantis. This guy is on the lookout for a female. 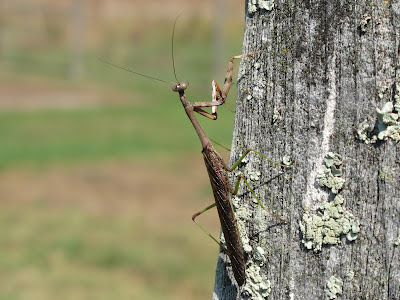 I imagine that mating time is when the Chinese Mantis has its opportunity to thin out the Carolina Mantis population. The two species probably have courtship activities similar enough that they become drawn together. 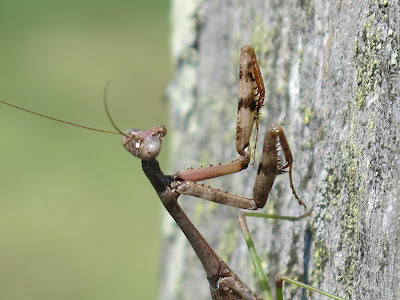 This would lead to the smaller Carolina Mantis becoming a meal for the Chinese Mantis. I’ll continue destroying the invasive mantis egg cases and hope that the Carolina Mantis population continues to grow. Note: For the past couple of months I’ve had increasing problems uploading photos to Blogger. It is now so bad that it took many attempts over a two day period to upload the five photos for this post. Until I’m able to correct the problem, posts will be infrequent, if at all.